No, this is not about immigrants or armies invading America. Besides, Chinese troops would have to swim the Pacific since China’s navy isn’t large enough to move a force that size, since China does not have America’s military capabilities. This post is about China’s classic novel, “Journey to the West”. There are four novels that are considered Chinese classics—Romance of the Three Kingdoms, Dream of Red Chamber, Journey to the West and The Outlaws of the Marsh (some of these classics have been released in other titles). 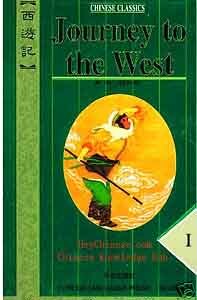 In fact, there are three Chinese books titled “Journey to the West”. One Journey to the West is nonfiction about K’iu Ch’ang Ch’un, who visited Genghis Khan in Persia between 1221 and 1224. The second Journey to the West is another nonfiction account about Hsuan Tsang, a Buddhist monk who travels to India to bring back Buddhist scriptures. The third Journey to the West is a fictional romance that introduces the Monkey King and his friend the Pig on their journey to the West. This entry was posted on Saturday, July 31st, 2010 at 08:00 and is filed under China, Chinese arts and music, Chinese Culture, Chinese history. You can follow any responses to this entry through the RSS 2.0 feed. You can leave a response, or trackback from your own site.